Salumi, salami – what’s the difference? Salami, salumi, salame – they all sound similar, but refer to specific delicacies. Follow us on this deep dive into the delicious world of cured & cooked meats. Salumi is the equivalent of “Charcuterie” and refers to the Italian art of transforming and preserving meats, often through curing. Salumi includes all the chubs, cooked ham, cured hams, and slicing salami that you can think of. Although the meat is most often pork, Italian salumi specialties also make use of beef (bresaola), game (boar salame), and more. 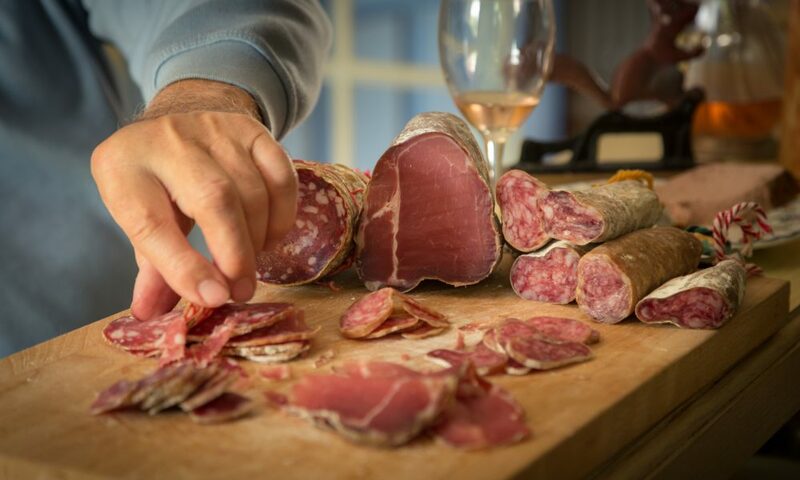 They can be divided in three broad categories: whole muscle salumi, salami, & cooked specialties. As their name implies, whole muscle salumi are made from whole cuts of meat. The preferred preparation requires little more than salt, the occasional spice, and time. The salt will leech out the meat’s moisture, while protecting it from harmful bacteria. This family of salumi includes prosciutto, guanciale, coppa, pancetta, culatello, speck, bresaola, and more. These cured meats are usually eaten as is, but some specialties, such as guanciale or pancetta are meant to be cooked. Pan-frying them allows for some of their fat to render and crisp up: nothing beats these crispy-tender flavor bombs. The salting of the leg is a key step in the creation of a balanced prosciutto. Prosciutto refers to a dry-cured ham, made from a whole pig’s leg. Any prosciutto exported from Italy must be aged at least 400 days. These tasty legs are the benchmark of prosciutto, and are often sold under the name “Prosciutto d’Italia”. They are a cheaper alternative to the D.O.P. stamped Prosciutto di Parma & Prosciutto San Daniele, made with the same ingredients: pork, salt and time. These two beloved delicacies are prepared according to age-old recipes that dictate every step of their fabrication, from the breed and age of the pig to the time they spend being aged. Both are regulated by powerful consortiums that guarantee that all producers respect strict requirements, and work to promote their products. Interested in Prosciutto di Parma? Make sure to check out their new industry website, www.thewholeleg.com. 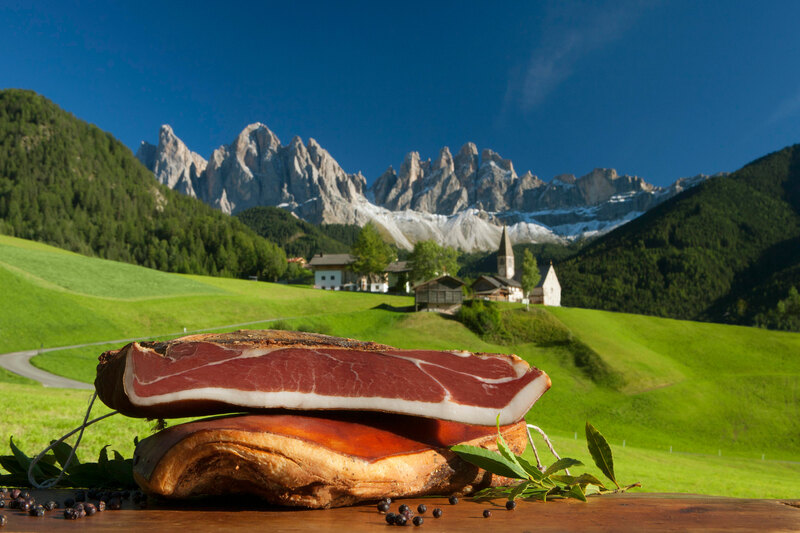 No, this is isn’t photoshop – speck is produced in breathtaking Alto Adige, an Italian region near Switzerland & Austria. Hailing from the mountainous Alto Adige region of Northern Italy, speck has become increasingly popular these past few years. It comes in the shape of flat slabs 2 to 3 inches tall. While similar in texture to prosciutto, speck has a whole different flavor profile: it is seasoned with spices such as juniper and rosemary, and is cold smoked before being left to age. Thin slices of speck are a wonder on their own, but are equally tasty draped over pasta or pizza or briefly pan-fried. With a rustic appearance and bold, full flavor, coppa is more rustic than prosciutto … but no less delicious. 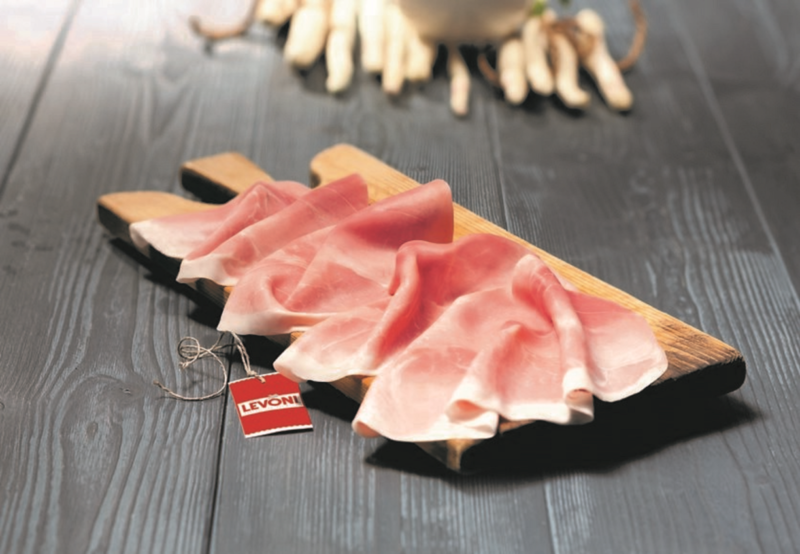 Also called capicollo – or even gabagoul – coppa is heartier than prosciutto or speck. Typically made from the neck and shoulder of the pig, coppa has a darker color, and wide streaks of fat. Generously seasoned with ingredients such as garlic and wine, coppa has a sturdier mouthfeel and more powerful flavor, typically best enjoyed on fresh bread. There are dozens more whole muscle salumi we could dive into, but those are some of our favorites. For optimum freshness, they should be sliced to order – although pre-sliced flatpacks have come a long way and now offer a delicious, on-the-go solution. All salami are part of the salumi family, but not all salumi are salami. Got it? Salami is the plural of salame, and refers to meat that is ground, seasoned, stuffed in a casing, and left to cure. The curing can be controlled with the use of chemical additives, or simply nudged along with natural additions such as celery salt. In the case of the latter, the salami is said to be “Uncured”, and contains no added nitrates or nitrites. The salami can be small – “chubs” – or large. As the salami dehydrates, its flavors will concentrate, and it will develop its signature bumpy skin. Milano: fine grind, smooth texture, and sweet flavor. Napoli: fine to medium grind, with a mild flavor. Genoa: fine grind, made with extra lean pork. Often made with garlic, black pepper & wine. Calabrese: medium grind, features crushed red pepper for a spicy flavor. Toscano / Finocchiona: medium grind, studded with sweet fennel seeds. Felino: medium grind, flavored with cracked black pepper and wine. Originates from Parma. 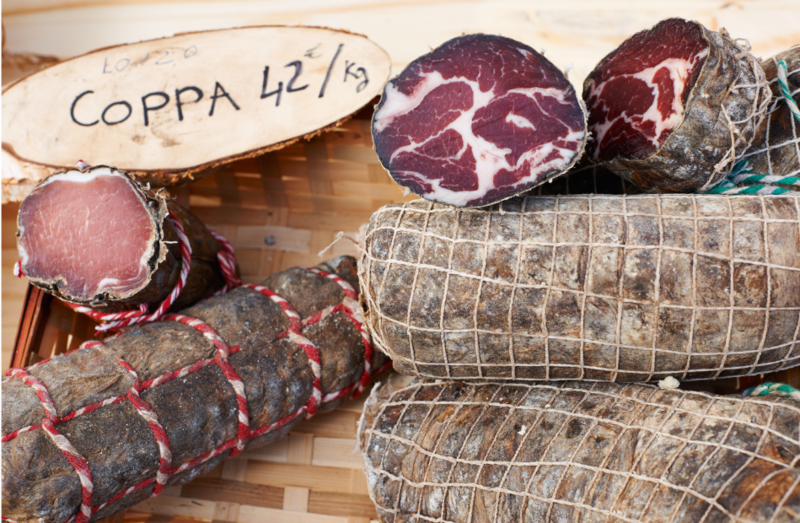 Soppressata: medium grind, mild flavor often enhanced with fennel and garlic. The most popular salami in America! Hungarian: extra fine grind, supple and moist texture. Smoky flavor. Chorizo: coarse texture, with bold flavors (sweet or hot smoked paprika). While curing, the meat mixture will lose up to 30% of its water content, thus concentrating its flavor. 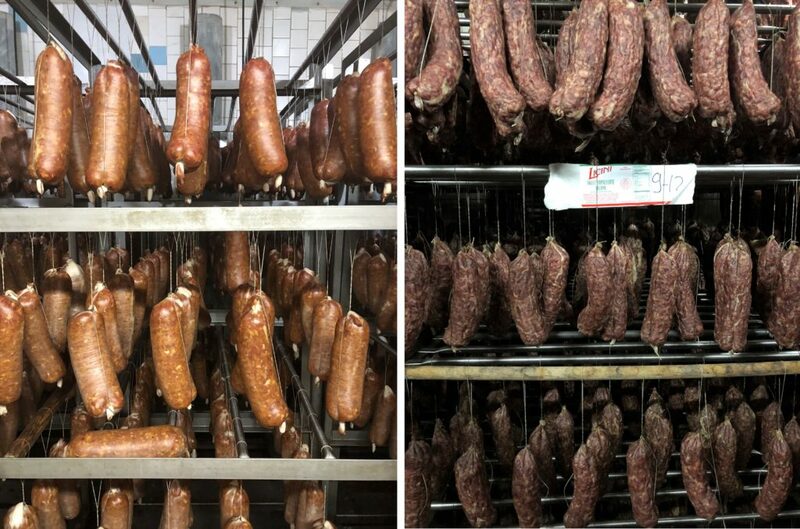 The exterior of the sausage blooms with a specific type of mold that plays multiple roles in the curing. The mold ensures no bad bacteria take hold in the salami, and prevents the meat from drying out too fast. This white mold is perfectly edible, but many producers prefer to wipe it off and apply a thin coat of rice powder to the salami – deemed more consumer-friendly. To enjoy your salame, peel back the casing (if it’s a natural casing, it can be eaten safely), and slice on a bias. The thickness of each slice depends on your taste – but make sure to let the slices rest at room temperature for a few minutes for their flavors to bloom. Wait, what about cooked specialties? Slicing prosciutto cotto extra thin allows for its pure pork flavor to truly shine. While very similar to American ham, Italian Prosciutto Cotto has a few distinctive features. It tends to be made from a whole leg – unlike domestic items, often crafted from several chunks of meat bound together. Their color is much paler, and they flaunt a drier, yet tender texture. 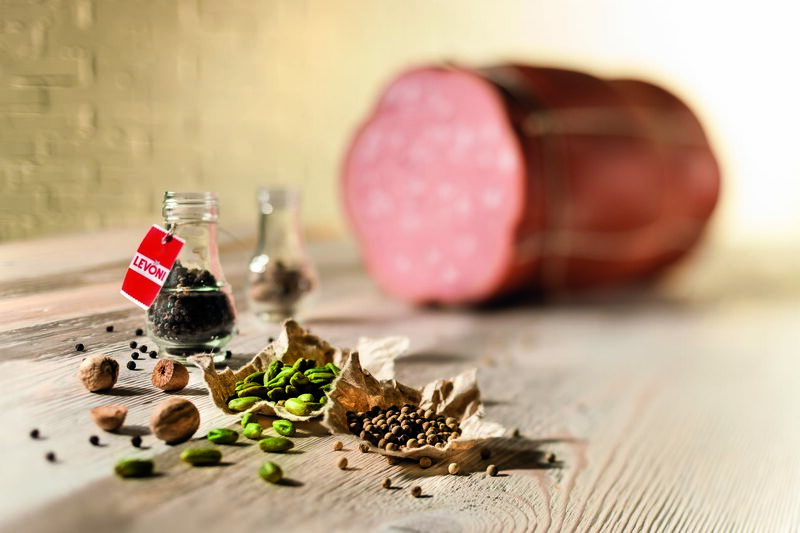 Mortadella is prepared with a variety of spices, each blend specific to its produttore. A customer favorite! Hailing from Bologna, this thick and smooth salame stands out thanks to its pale pink color, studded with soft cubes of fat. Pistachios often dot each slice. The silky texture of Mortadella comes from the treatment of the meat: instead of being ground, it is pounded into a soft emulsion. Tradition dictates that a mortar and pestle be used for the job… but machines now save salumi makers from the elbow grease. That’s all folks! Do you have an unanswered salumi question? We’re here to answer all of your cured & uncured musings – just shoot us an email at info@muscofood.com.